The area of Pike Township that would later be named New Augusta was purchased from the federal government in 1834 by Thomas Reveal Jr. Reveal lived in Highland County, Ohio, at the time of the land purchase. He and a number of other family members migrated to Marion, Boone, and Hamilton Counties in the 1830s and 1840s. 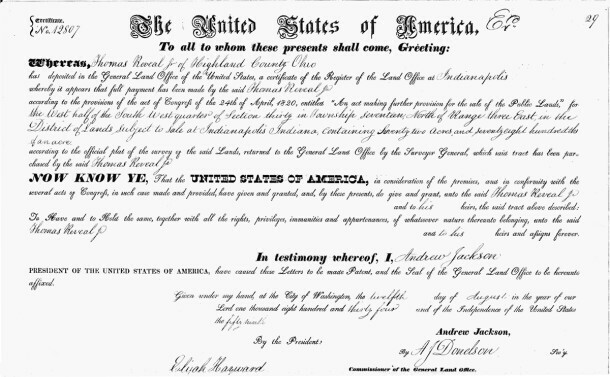 The document certifying Reveal’s purchase, issued by President Andrew Jackson, appears below. By the 1850s, the northwest portion of Reveal’s land was acquired by Christian Hornaday, and the south and east portions of Reveal’s land were acquired by Joseph Klingensmith. The map below shows their parcels, as well as those of surrounding landowners in Pike Township (note that Hornaday is misspelled as Horniday [sic]). 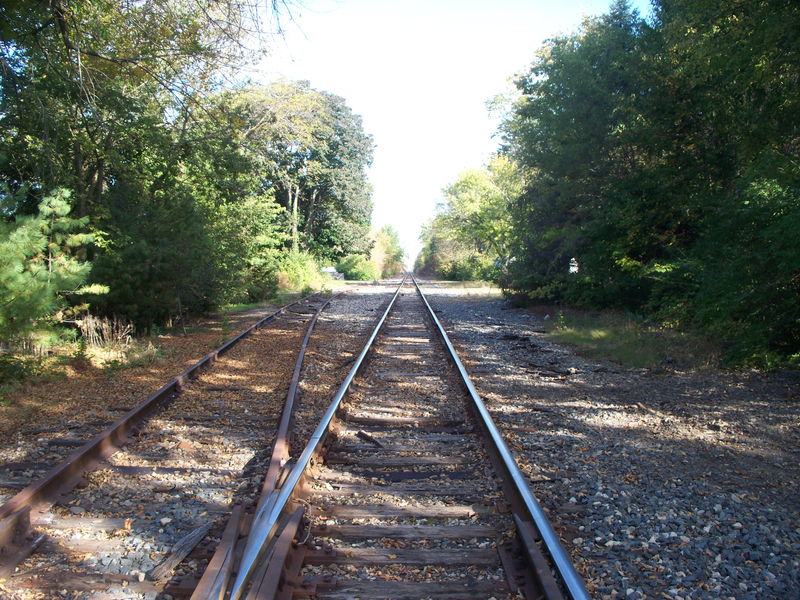 In 1852, the Indianapolis & Lafayette Railroad built a route about a mile-and-a-half west of the existing town of Augusta. 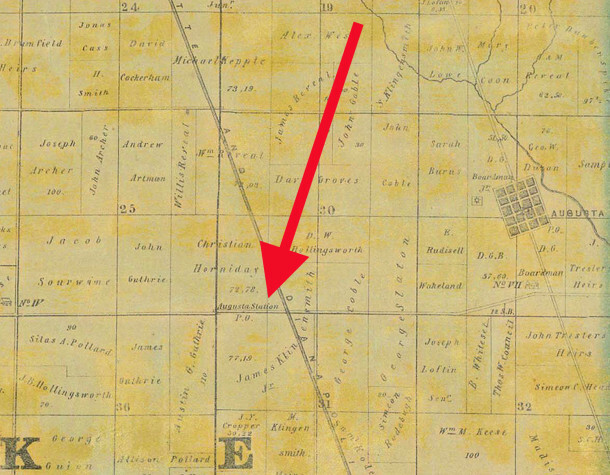 The tracks, which were laid parallel to the Michigan Road (aka US 421), passed diagonally through the parcels of land owned by Hornaday and Klingensmith. 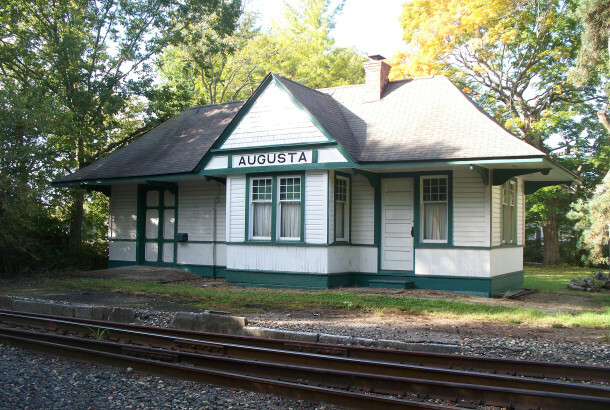 As no town existed yet at the spot where the railroad depot was constructed, it was called Augusta Station for the town to which it was the nearest, Augusta. The first Augusta depot burned to the ground about 1890. Within a few years, a new station was built, which survives today. 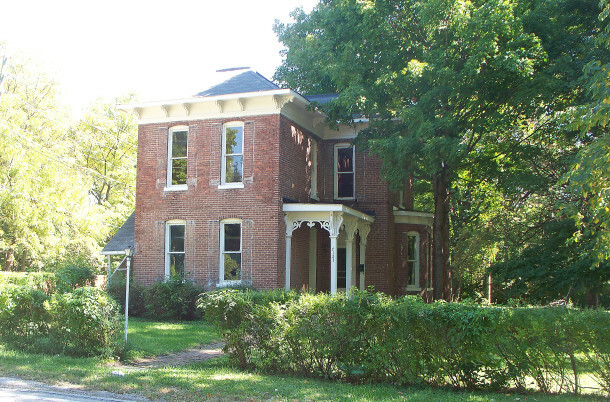 When passenger trains ceased to travel the route, the building was acquired by the Purdy family, whose home was immediately north of it. Mary, Emma, and Olive Purdy, the grandaughters of New Augusta settlers Ephraim and Adeline Purdy, maintained the depot to the ends of their lives. The residence and Augusta Station were inherited by a Purdy relative and are still in the family today. Christian Hornaday passed away around the same time the railroad was constructed. As the administrator of Christian’s estate, William Hornaday decided to capitalize on the opportunities provided by the new railroad. He enlisted the assistance of Marion County Surveyor Percy Hosbrook to plat the land west of the railroad tracks. In recognition of the surveyor who helped him lay it out, Hornaday named the development Hosbrook. For the next couple of decades, the settlement was alternately called Augusta Station and Hosbrook. It was never officially incorporated as a municipality, but with a train depot and a post office, as well as a number of commercial enterprises, it functioned as a town. 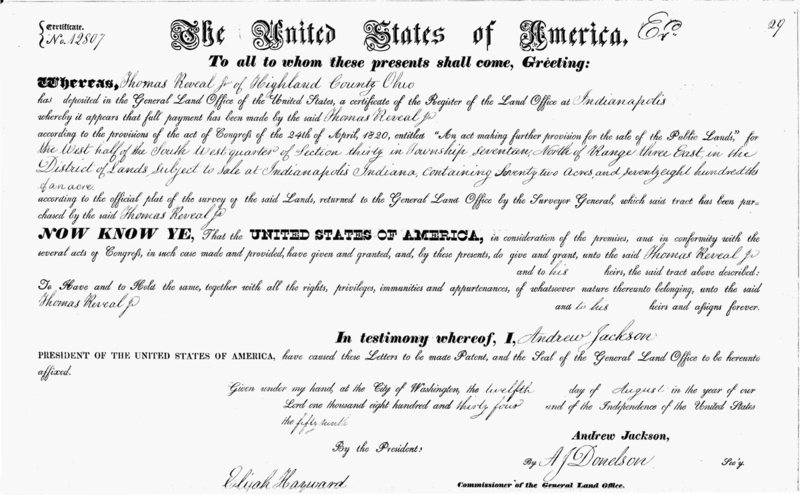 Eventually, the United States Postal Service required that a new name be chosen, because both Hosbrook, Indiana, and Augusta, Indiana, already existed. 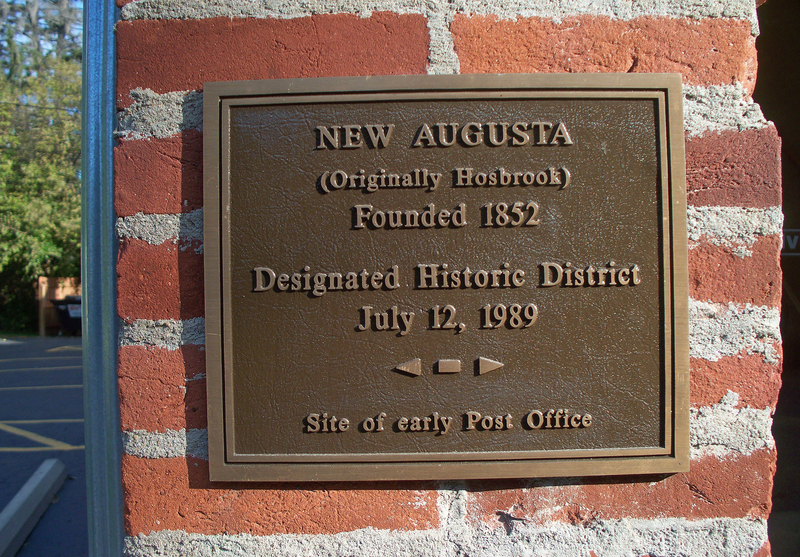 Effective October 1, 1876, the name “New Augusta” was adopted. None of the earliest commercial structures survive from the 1850’s and 1860’s, but numerous buildings from the 1870’s, 1880s, and 1890s still exist today. 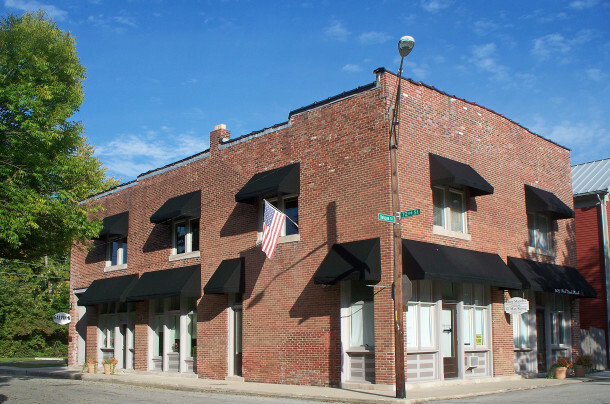 The Oddfellows Building, built about 1890 on the northwest corner of 72nd and Dobson Streets, has provided space for a variety of businesses over the years. The narrow streets in New Augusta date to the 1850s, when the village was created. 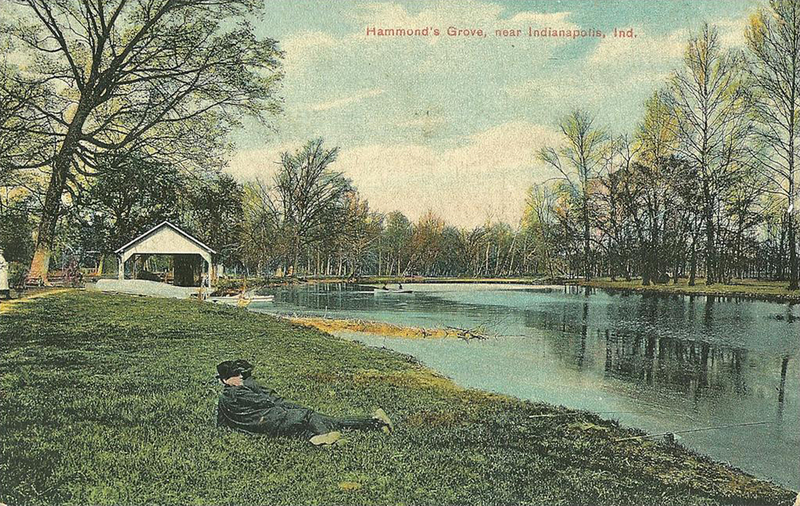 The names of the streets reflect the names of some of the families who owned property in the area in the late 1800’s and are not found anywhere else in Indianapolis. They are Purdy, Dobson, Pollard, and Coffman. Other surnames with early New Augusta ties (besides those surnames already mentioned earlier) included Avery, Coble, Cotton, DeLong, Englehardt, Fearin, Featherstone, Griffey, Guion, Gullefer, Guthrie, Hessong, Hightshue, Hollingsworth, Kissell, McCurdy, Neidlinger, Poe, Rodibaugh, Staton, Stirwalt, Sweeney, Turley, and Wachstetter. The great-granddaughter of New Augusta physician, George A. Coble, M.D. (1861-1937), has graciously contributed three photos from her personal collection, which appear below. Some of the styles of home construction in New Augusta include Italianate, Late Victorian, Gabled Ell, Bungalow, and Craftsman. 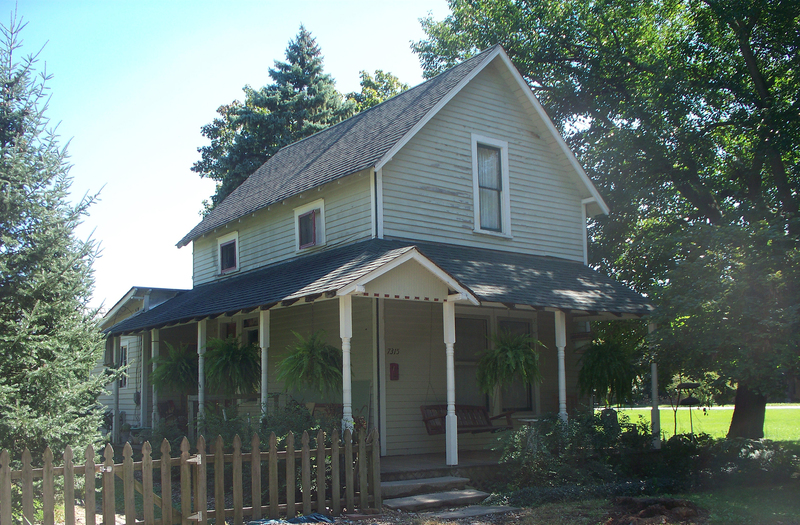 The building at 73rd and Coffman Road has gone through several incarnations related to public education in its 134+ years of existence. 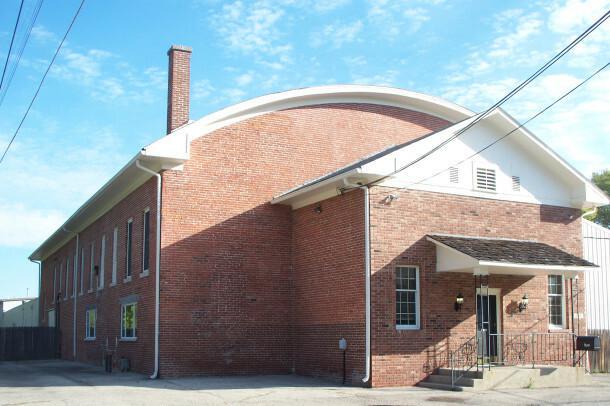 Originally a four-room schoolhouse, it was later enlarged and housed both grade school and high school classes. 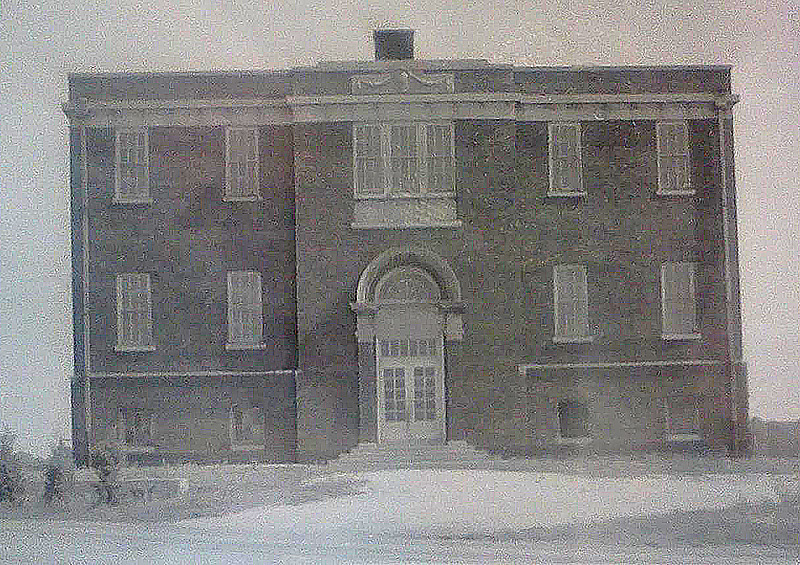 The structure then became the gymnasium for a new school built immediately to the east of it in 1909. That high school building no longer exists. New Augusta High School served Pike Township from 1889 to 1938. 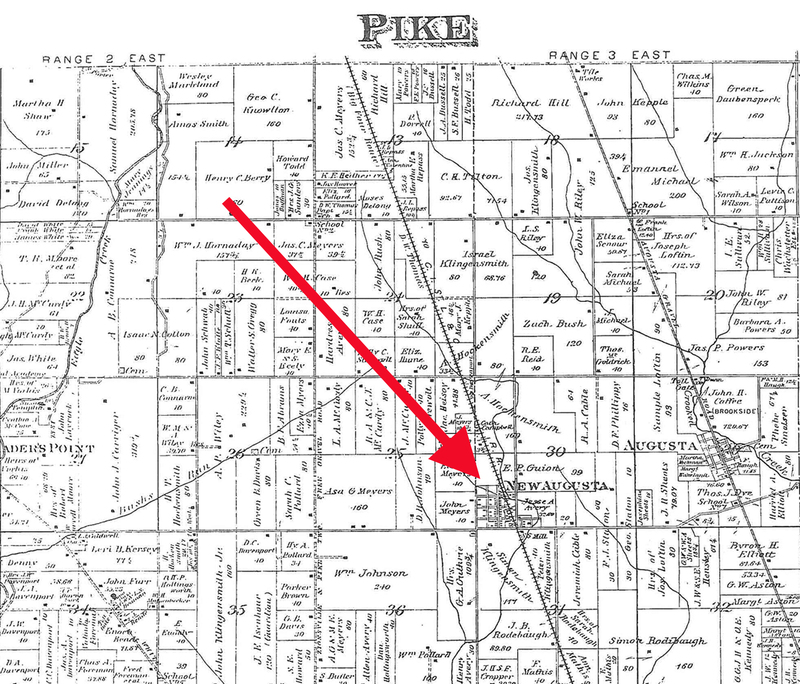 The public secondary school for the area is now called Pike High School. A 2012 HI Mailbag article about Pike High School can be read by clicking here. The Salem Evangelical Lutheran Church was originally organized in 1836 as the Hopewell Evangelical Church. 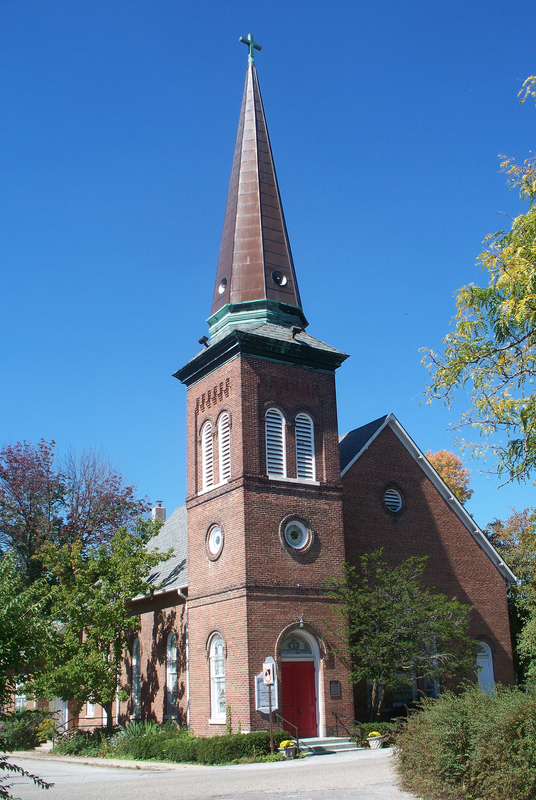 The congregation met in parishoners’ homes until the present church was built in the late 1870s. Over the years of its existence, the Indianapolis & Lafayette Railroad was owned by various different entities, including the Indianapolis, Cincinnati & Lafayette Railroad; Cleveland, Cincinnati, Chicago & St. Louis (aka The Big Four) Railroad; New York Central Railroad; Penn Central Railroad; and Conrail. In 1861, the railroad hosted Abraham Lincoln’s inaugural train, and in 1865, his funeral train. 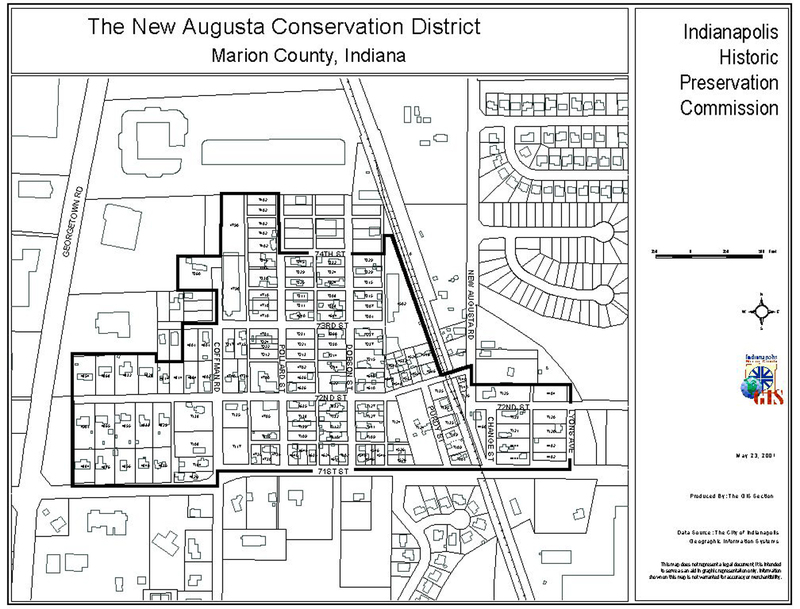 On January 1, 1970, New Augusta became part of the City of Indianapolis when the city’s boundaries expanded to include all of Marion County under UniGov. In 1989, New Augusta was placed on the National Register of Historic Places. 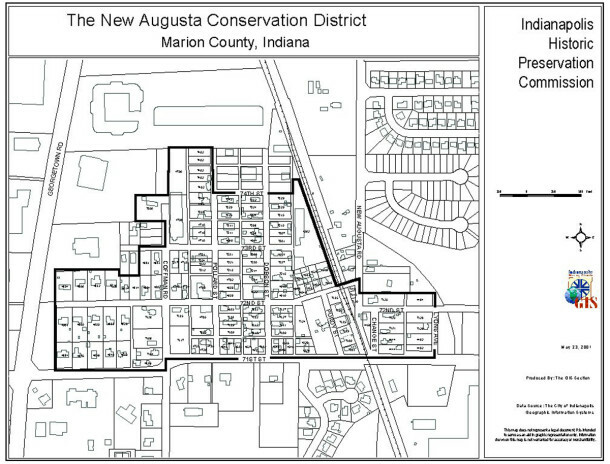 In 1999, the property owners in New Augusta voted to become an Indianapolis Conservation District. 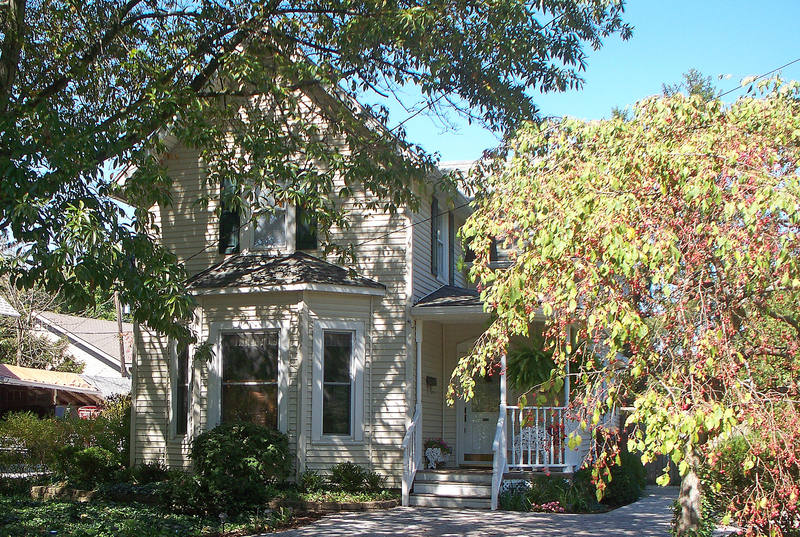 A conservation district is a special category, different from a traditional historic district. It focuses on conserving an area’s historic community, rather than protecting its historic architecture per se. Roughly bounded by West 71st Street on the south, West 74th Street on the north, New Augusta Road on the east, and Coffman Road on the west, the district is overseen by the Indianapolis Historic Preservation Commission (IHPC). Today, New Augusta retains the ambience of a 19th-century railroad village. Barns, sheds, root cellars, and carriage houses can still be found in homeowners’ yards. It’s one of only two intact nineteenth-century railroad towns in Marion County. The other is Acton, in Franklin Township on the far southeast side of Marion County. New Augusta’s architecture and streetscapes provide a glimpse of what it was like to live in the rural villages that sprang up al over the country in the 1800’s, as a result of the building of railroads. The district retains many of its small town characteristics, and its residents and businesses maintain a strong sense of the community’s past. If you have memories of living in or near New Augusta or visiting someone there, please leave a comment below. Outstanding writeup. I’ve wondered about New Augusta’s development and history. I’d heard at some point that the people of Augusta largely abandoned their town when the railroad came and moved to this site, but it sounds like, at best, this isn’t the whole story. This is a favorite place of mine to go to take photographs. The 1875 Italianate looked abandoned for a long time — your photo shows that it’s received some attention. That’s great! Once a week in the evening during the summer, they had movies outside projected on the side of the old school gym. Just north of the train station was a large grain elevator (mill), where we took our corn, beans, and oats to be ground or sold. I knew several of the descendants of the names mentioned. One of the family names, a George Klingensmith, ran a general store on 71st Street by the train track. Dr. Charles Dobson was the township veterinarian, who, of course, made farm calls. Two sisters from the Purdy family restored the old train station. Another prominent family, who should have a monument or plaque dedicated to them was the Ashers, Dr. E. O. Asher and his son, James, who cared for most of the township from birth ’til death. Together, they must have practiced at least 60-70 years. 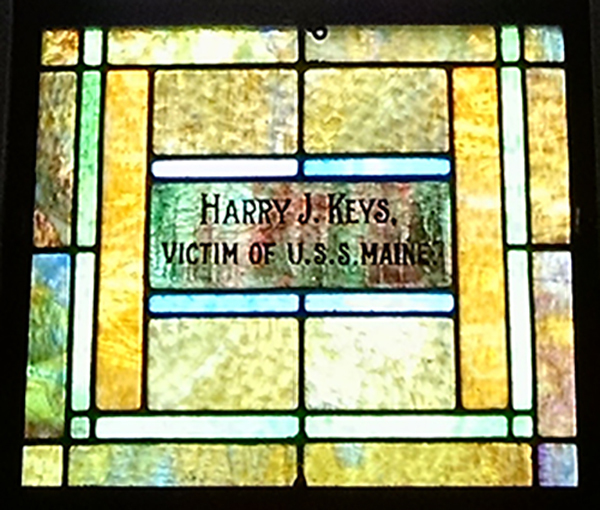 Their office was in a renovated house next door to the Salem church. New Augusta stands as a kind of oasis of the old days in the middle of a commercialized, heavily populated area. It’s nice to know it will be protected. I’m so glad to have found this information. Small towns and historic neighborhoods fascinate me, and I just discovered this one today as I was searching for Organic Health Alliance/Indy Thermography, where I have an upcoming appointment. I couldn’t stop myself from driving around the area, admiring the very buildings you have pictured in your article. My girls are the same way. Glad, too, that it’s been preserved for us to enjoy. The information about New Augusta brought back so many memories. I am related to the Klingensmiths, Clines, Ottingers, and Rodabaughs. When you look at the map of New or Old Augusta, you will see the names and many more who moved from Westmoreland County Pennsylvania to this area. They were Lutherans of German backgrounds who had made their way to Pennsylvania and moved westward to Indiana. Dr. Dobson was our family vet. Dr. Asher was the doctor for my family before I was born. 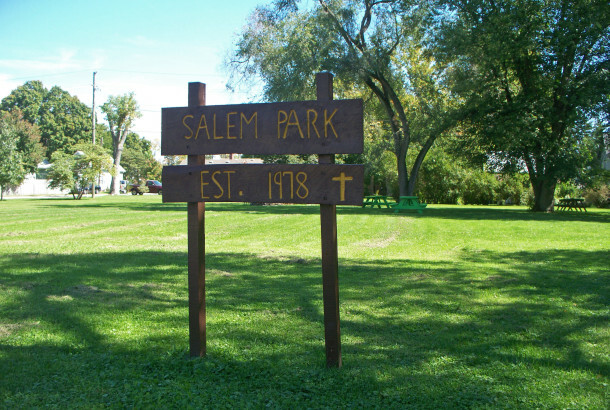 The Salem Church was founded by many of the Lutherans who came from Westmoreland County, Pennsylvania. They are buried in the cemetery on Guion Road, I believe. My brother and I rode through New Augusta a couple of years ago on our motorcycles and took a break at the church. A very nice woman came out to see who we were, and we got into a conversation about the church and the town. She was very knowledgeable about all of it and has several pictures and research she has done on it all. I don’t recall her name, but you may want to swing by there and see if she is available. Hope this helps, Jamie Jackson. I grew up in the little town of New Augusta in the 60’s. I remember the general store next to the train tracks. We called it “Elmer’s” store. No idea why. It was a train car made into a store. It was very old and cluttered, but he had everything from candy to guns. That’s back when it was safe to cross 71st street as a kid. I also remember going to “the mill”. It was a grain store with horse tackle, and you could also buy clothes and a cowboy hat if you needed. I remember the Purdys and the Blues and the Bowdens and several others. There was an old woman who walked up and down Dobson Street every day, carrying a bucket to and from a huge old barn at the end of the street. No idea what that was about. Anyway, thanks for racking my memories. In my comment above, I noted that George Klingensmith ran the general store. In checking the Polks Suburban Directory 1962, it was Elmer Klingensmith. We just called it Klingensmith’s back in the 50s. We used to stop in there for a cold Nehi orange soda when biking to school during the summer for band practice. There is a Pike Township Historical Society. I’m not sure how active they are, but there is a website: http://mypikehistory.info. Also, Jamie Jackson, are you related to Jim Jackson who lived just north on New Augusta Road across the track from the mill? He would have been born around 1940, and was in my class at Pike for a few years. Not related as far as I know. I think I know which house you’re talking about though. A little blue/grey house by the creek. They had chickens and a couple of horses, if I remember right. We lived on the s/e corner of Pollard and 74th, across from Mr. And Mrs. Bowden. She used to make the best peanut butter cookies. Very good article. I know about New Augusta and spent time there as a boy but never knew or bothered to know the detailed history of it. Went to Fergies Barber Shop there in the early 60’s and Doc. Asher was the family doctor for years. My Uncle Jack Monninger and his family lived there for several years. And of course, several kids I went to Pike High School with lived there. Thank you for the great article. I grew up by New Augusta. My dad had his hair cut at Fergie’s Barbershop. We stopped at the market for a Coke. 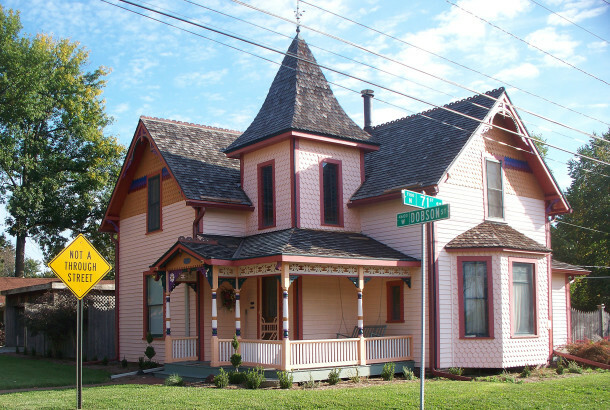 My best friend lived in the colorful Victorian pictured in the article. We were friends with the Bannister boy and would walk to their farm on New Augusta Road. I attended Job’s Daughters in the bank building that Dillinger robbed. So many neat connections with New Augusta. Thanks again for bringing back those memories! Steve: You mentioned Jack Monninger. I think he was the art teacher at Pike during the 50s. I didn’t realize that he lived in New Augusta. Yes, Jack Monninger was an art teacher at Pike. He lived in Augusta, I believe in my aunt’s parent’s house, in the 50’s. I will see if I can confirm just exactly where that was. Don’t know if this is any help, since the street addresses were not published then, but in the 1957 Indianapolis Suburban Directory (the first edition to include areas outside the old city limits), Jack was listed at RD 18 Box 558 Indpls. I am jack and imogene monninger’s daughter. We moved into our recently widowed Grandmothers home to care for her. She did not drive and our home was to small for her and our growing family. 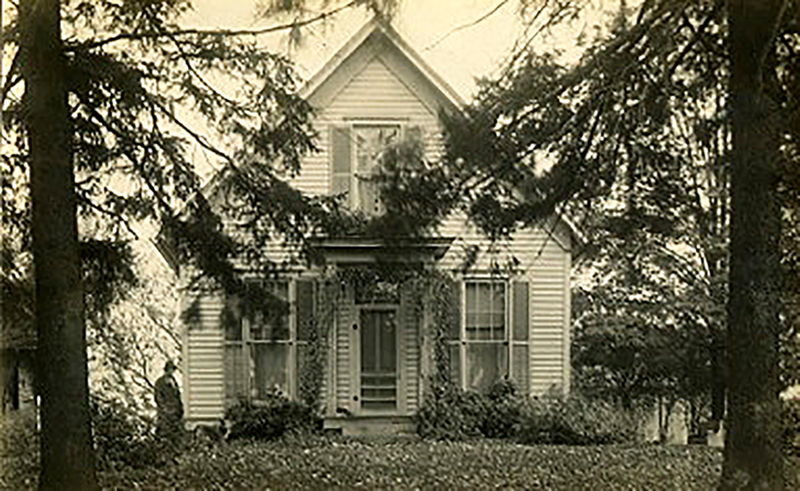 The house was in old augusta on michigan road. My parents inherited grandmas half home ownership and bought the other half from our mom’s step-brother Edward Bartley of New York. Jack’s sister was an English teacher at Lincoln, too–but I can’t remember her married name now. Jack had a sister named Margarete Monninger Walker, who was a teacher. She passed away in 2004. Ha. My Dad used to take me to Fergie’s for haircuts. He had a real old coke machine, and they were only a dime. I forget the name of the bank (changed names a few times), but once a year they had a “street fair” behind it. And the Standard gas station gave away S&H Greenstamps. And they checked oil and washed your windshield. I enjoyed the article on New Augusta. My Mother, Pauline Trester, grew up around that area, and her grandparents with the last name of Trester owned a house in Old Augusta on Michigan Road. There also was a Mill that we bought many things for their garden. Hi Gloria, Good to hear from a fellow Pike band member. Was your grandfather related to Albert Hardin, who was township trustee when we were in school? Hi LaRue – Albert Hardin was my uncle – his dad was Marion Hardin who was my grandfather’s brother – so good to hear from you. So glad my niece shared this article on Facebook with the Millers. Such great memories and information about my town. Hi Sherry. Yep, Danny and I are brothers. I remember you, Mike, Vickie, Greg (Kent), and Shawn. We all hung out at one time or another. Baseball in the field, bikes around the block, or drinking water at the pump. Or go to the mill and buy a Red Pop. Finding insulators along the train track. Climbing the tree at the church. So many more memories. Jacksons, Millers, Shaws, Arthers, Newkirks, Watsons, and even the Twittys. I’m sure there were more, but I can’t recall. All in a very safe neighborhood. What a great time and place to grow up. How awesome are all these memories!! Yes, all of us running around town with no worries. We were so lucky to have a whole town full of good families. I still talk to a few of them today. Jenn Shaw was my best friend. Sadly she passed years ago, but her sister, Judy and her daughter, Crystal, are still around. Funny that you remember a couple of my older siblings. You are younger than Danny, if I recall. Our family was the largest around. Do you remember the last name of the people that owned the gas station at 71st and Dobson?? I remember their first names. It was Allen and Ruth. Allen had a bit of a lithsp. Great people! They were my parents’ age, but I remember they have a couple of girls that were my older siblings ages. They lived on New Augusta Rd. I can picture the old lady walking up and down the street. For the life of me, I can’t recall her name. I do remember we were afraid if her and refused to walk up on her porch. Sad to think about that now, as she was probably lonely. Jphariss-i lived in Dr. Dobson’s house. I knew it was a doctors office at one time, and he lived upstairs. I didn’t know he was a Vet or that the street had been named after him. Good stuff!! According to a 1974 suburban directory, the last name of the family who owned the service station was Brooks. It would appear that the parents were John and Ruth, and the son was Allen. Does anyone remember the “big” centennial celebration parade back in 1955? I remember playing in the Pike band and I think there were some floats pulled by tractors. I love, love, love all of the comments. Keep ’em coming. Would like to get in touch with Robin Engls, Dr. Coble’s great grand daughter. I have information on him she might not have and I would like to talk to her about her research on the Coble family. By the way Sherry, I forgot to mention knowing your brother Gary. Just didn’t want to leave anyone out! There are so many people to remember. How sad to hear about Jenn. She was a riot to be around. Always laughing about something. Jan was her mom. She had Jack, Judy, Jenn, Jeff and Joy. Jan died years ago, as well as Jeff. Lost touch with all of them after Jeff died. Saw Jack once a few years later. Didn’t really know him. I sure don’t remember the name of the gas station owners, but I still remember their faces. I used to go there every day to get my Mom a pack of Salem for $.45 Of corse my service charge was $.20 coke. We called the little old lady “old Lady Pollard.” We were afraid of her for some reason. She had a lot of dogs in her barn that barked all the time. She owned the farm at the end of Dobson and I believe, if I remember right, she also owned the little house on the left side of the Arther’s house. I think her barn ended up burning down. Fuzzy memories. I believe you’re right. She was probably a very nice lonely woman. Here’s a memory. We lived right by the fire station. That siren used to scare the ***t out of me. It was sooooo loud! I could see the lights from Rock Island Refinery from my bedroom window. One evening, I was looking at them and saw what I thought was a bunch of soldiers in civil war clothing marching across that field. My parents told me it was a bad dream. Of course the soldiers were gone when they came to see what I was yelling about. I remember it like it was yesterday. I hadn’t even been asleep yet. Well, who knows. When she talks about it, I sense it was a magical place for her. I have been working on a booklet for her about the history of New Augusta as it relates to our family. Jeremiah Coble would be my great-great-grandfather. Hi Robin. Might sound like a silly question, but did you have a horse named Duke? I do not have a horse named Duke, nor did my mother. 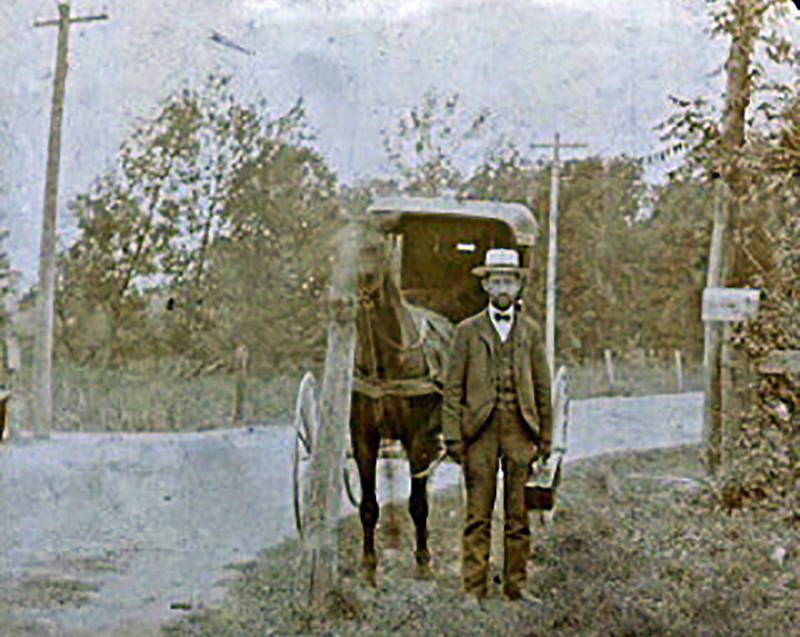 However, if someone can tell me how to post a photograph on here, I have a picture of my great-grandfather, Dr. Coble, standing next to his horse and small buggy. As I mentioned, he was one of two (?) doctors in New Augusta from roughly 1890 – 1939. Perhaps that was the name of his horse!! 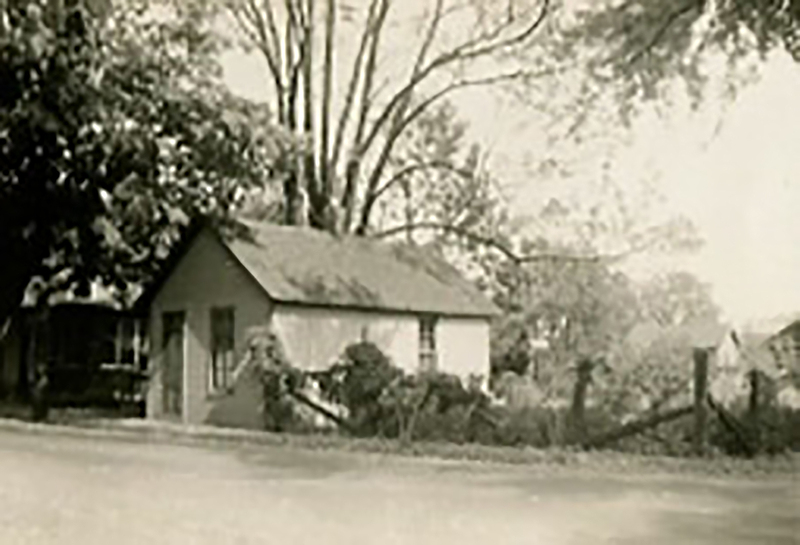 I also have pictures of his house in New Augusta, which still stands today, and his doctor’s office, which does not. I don’t believe there is any way to post photos in the Comments section. If you will send the photos to me as e-mail attachments, I could insert them into the article. If you would like to do that, let me know the approximate year of each photo and how you would like to be credited in the captions. Jamie. Funny that’s your memory, because that field is where we used to play Army. You always had a great imagination. Ha ha. I remember your house well and all the drum playing. Also, the Newkirks (Rick. Mike, Becky and Jeff). You got all the Shaws. We had 10 kids, so you remembered most of them. It was Ben and Vince Arthur. Someone mentioned the Bannister boys earlier. They were farmers so weren’t really able to play much as kids, but I hang out with Curt as married adults for several years. Mr. Bannister was our bus driver. And you’re right, the old lady”s last name was Pollard. Another person whose name was used for a street name in town. I have a lot of memories I could share, since I lived in New Augusta from age 2 to 19…..and then moved back with my husband (renting the small house from and next to my parents) from age 21-26. Had two kids born in our town, and they were able to spend several years visiting my family that hadn’t left yet. My mom sold the two houses several years ago after my dad passed, and the new owners have made a lot of changes…..but they’ve been good ones. Ha ha. I do remember playing army too, but I was just a little kid with a broken cap gun. Just happy to be involved in something. I remember baseball because I was so bad at it. Kent on the other hand was good at it. Ben and Vince Arthers had a little brother named John too. Funny you remember the drum playing. I still play a little for fun. I got tired of the bar scene and retired my sticks. My Brother Danny after years of drums went on to pursue music professionally as a keyboardist. I remember Ricky Newkirk cutting his arm wide open on our fence. Needed stitches. Tough kid. He didn’t even cry. Duke the horse… Hmmm, was that the family that lived on the left side of the Newkirks with the white horse? It threw me off and stepped on my ankle! Forgot all about that. Might be why my ankle hurts today. I saw someone above mentioned that it was Brooks that owned the gas station. I remember that now. They lived on New Augusta Rd. Across from the train depot. I remember two of the kids or grandkids, Jeff and Patty. Remember the big hill behind the gas station we used to ride our bikes up? Well, I never made it. Crashed several times trying. Hi Jeff. I lived between 71st and 72nd on Dobson. Big house with screened in porch and a small house right next to it. Are you related to Jana? I went to school with her. Jana is my sister, Thanks for replying. I am in the process of fixing up the old house. I like going out there and really enjoyed reading the real life stories about growing up in the area. It sounds as if it was a fun place to grow up back then. I was just thinking that the people may have been named Shaw who used to live in my cousin’s house. I really can’t remember. It’s been nice hearing from you, maybe I will meet you out there one day, I am sure I will be working on the house this spring. Yeah. I believe it was Shaws’ house where your cousin lived. It was on the corner of 73rd and Dobson. It was truly a great place to grow up! I’m sure I’ll come by sometime this spring and see what you’re doing to the house. That would be marvelous! I know you went to Shortridge and graduated with the Class of 1966. I am the one who has been organizing the Class of 1965 reunions for the past 50 years. Since you started at Shortridge in the second semester of our freshman year, I have always included you in our reunion mailings. Our class has always welcomed anyone in surrounding classes to join us for our reunions. I hope you’ve received those mailings. If not, let me know. I may not have the correct address for you. I thought that was you. I do get those notices, I just never get around to going. I will try this summer. You are doing a great job with all of your work. It is really interesting. Hope to see you soon. My address is 7860 n. Whittier Place Indianapolis 46250. Yep, that’s the address I have. Thanks! I am the youngest of four children from Tom and Helen Head. I was born in the house at 7111 Dobson St. The Millers bought it in 1961 from my parents. My grandmother lived next door in the little house, which my parents owned as well. Later, they rented it to two sisters, I believe. My mother worked at the post office in the red brick building you have pictured. My father was a volunteer fireman at the fire station near the original schoolhouse. Farrington’s Soda Shop was on the corner next to the post office, and I remember going there often for ice cream. Harry and Catherine Connaroe lived across the street, as well as his father in the house next door to them. Gerald and Gladys Young lived on Pollard Street, and his parents lived nearby as well. They owned an insurance agency in New Augusta. I currently own that house! I would love to see old pictures of it, or any stories about it! Anybody remember going to Doc Asher? There were two of them, father and son. To LaRue: Jim Jackson, whom you mentioned, lives one block from me now in Avon. We get together often. We lived at 86th and Payne Rd, and I would ride my bike to Jim’s house on New Augusta Rd. You. Jim. and I were classmates, Class of ’58. I remember the movies on the wall of the old gym. Hi Steve (Hess), I was trying to remember when “Jimmy” left Pike. I think we were still in grade school. Do you remember coming to our farm for my cowboy birthday party, probably back in the ’40s? I still have a picture of us cowboys with guns drawn. It includes you, Jim Jackson, Bob Young, Bruce Milby, Don Reese, and several others. I had one horse, so we had to take turns riding the range. Good memories of long ago. Thank you for this article. I graduated Pike Twp. 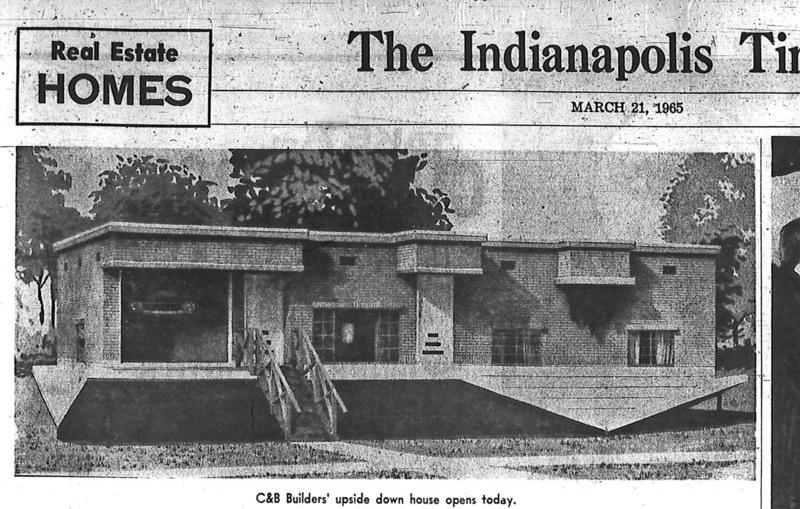 in 1957, and during those high school years delivered the Indianapolis News newspaper, later taken over by the Indianapolis Star, in New Augusta. The pictures and names brought back so many wonderful memories. Two of the Purdy girls, as they were call in those days, were still living and kept a beautiful yard full of flowers. Then there was the general store, the barber shop, the bank where I financed my first car. I remember a farmer I did a job for wrote me a check using a piece of coal he picked up off the ground. The bank said, “Oh, yes, we know Mr. White,” and cashed the check. In the summer they showed movies on the side of one of the buildings, and the whole town would gather to watch them. So thank you again for the memories. Well, this thread has been dormant for a year — let’s see if we can reactivate it! I didn’t grow up in New Augusta, but I spend quite a bit of time there. Pied Piper Kindergarten was in the basement of Salem Lutheran Church and I attended it when it was run by Mrs. Crook and Mrs. Bailey. My first bank account was at the Indiana National Bank branch in New Augusta, and Young & Sons provided my auto insurance for many years. I got my first kiss from a girl who lived in the Queen Anne house, and I later dated the church secretary’s daughter, whose cousin is still a good friend. Their grandparents lived just west of the mill, and some of us used to hang out in the barn behind their house and tinker with cars. Some of the families I knew in the village in the 1960s had the last names of Blue, Boyer, Brooks, Hollingsworth, King, Patty, Siler, and Young. E. J. Klingensmith’s general store was a long wooden structure on 71st street just west of the railroad tracks, painted orange with Klingensmith’s name in large black letters. There were usually old men in overalls hanging out on the front steps, and we would go there to buy crackerballs, smoke bombs, and firecrackers, all of which were illegal at the time. I’d love to find a photo of the place, but haven’t been able to turn any up yet. My Great Grandfather was Billy Pollard. I remember my brother & I playing in their barn but cannot remember what street it was on. Of course back in the 40’s it would have been a road. If you have any info on the Pollard’s I would love to read it. I know there is a Pollard St. in New Augusta. My parents were not too good about keeping in touch, so that history is lost, which saddens me. We own one of the houses on Dobson and 73rd. When we were remodeling one of the upstairs bedrooms we found an old train ticket from New Augusta to Zionsville. Leo, I used to live across the street (56th and Guion Rd.) from a George Hollingsworth. He would have been in his 80s back in 1950. He had been a teacher in a one room school near there. Wondered if you were in his family line. He was living at that time with his daughter whose married name was Lyke, I believe. I was also in school with a Max Hollingsworth, but I’m not sure where his family lived. Dad was a member at the Hosbrook Lodge back in the 50s and 60s, and I was in the DeMolay for a couple of years. Earnest, The George Hollingsworth you refer to I don’t think is a direct relative. My great grandfather was George Hollingsworth born in New Augusta 14 May 1841 died 26 April 1884 and he didn’t have any sons named George. My grandfather Henry Leonard was a past patron of the New Augusta Order of the Jobs Daughters in the ’50s. I sure our families cross paths more than once. I grew up in Ohio, Brazil In Terre Hute In and Indianapolis I worked at an auto parts store at Michigan road and 71st in the early ’70s. Leo, thanks for the information. The Hollingsworth across the road from us was George Rufus Hollingsworth,1875-1958 who was married to Cora Florence Rodibaugh. I couldn’t find anymore about his family, but did find this article about a George Hollingworth. It was a common name then. Thought he might be in your family line. We may have shopped at the Auto Parts store on Michigan Road, although by that time we had moved to the northside. Always enjoy these remembrances and thanks to Sharon for passing them on. Churches, while the Klingensmiths were mostly members of the Evangelical Lutheran Church. this township, on Little Eagle Creek, near Bethel Methodist Episcopal Church, on the land now owned by W. H. Broughard. oldest son, George D. Hollingsworth, and the daughter Jane. was raised. He is engaged in farming and stock-raising, and is regarded as one of the leading agriculturists of the township.